I remember distinctly the first time I ever saw a can of Slice. It was summer just after I graduated from high school in 1985 and a group of five of us from my all-girls high school were going up to one of our friends' cabins. One of my friends brought a can of Slice along, and I swear we talked about it in the car for 20 minutes. What WAS this new beverage? Turns out we were a little behind. Slice came out in 1984 from Pepsi. I swear the flavor I remember is pear flavor, but doubted myself when I didn't see it listed in the flavor list. But now I see on Wikipedia that the original flavor was considered to be a mix of lemon-lime and pear, so apparently only the "pear" taste stuck in my brain. Shortly afterwards, Slice went to town on flavors, if the town was Fruitopolis. Strawberry, orange, grape, passionfruit, peach, mandarin orange, apple...if you could find it in the produce section, they could liquify it. "In the summer of 2000, lemon-lime Slice was replaced in most markets by Sierra Mist, which became a national brand in 2003. The rest of the Slice line was replaced in most markets by Tropicana Twister Soda in the summer of 2005, although the Dr. Slice variety can still be found in some fountains. In early 2006, Pepsi resurrected the Slice name for a new line of diet soda called Slice ONE. Marketed exclusively at Wal-Mart stores, Slice ONE was available in orange, grape and berry flavors, all sweetened with Splenda." Wow. Who knew? I guess I assumed it was still around, in grocery stores and gas stations, but I just never looked for it. Were you ever a Slice fan? 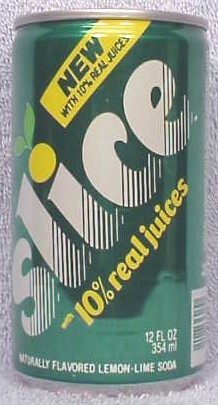 I remember a bit of hype surrounding the launch of Slice, mainly because some stores were giving away free cans (nothing, of course, compared with New Coke). I always thought it was dreadful stuff. Who knew it contained *pear* -- no wonder I hated it! I loved the pear taste!